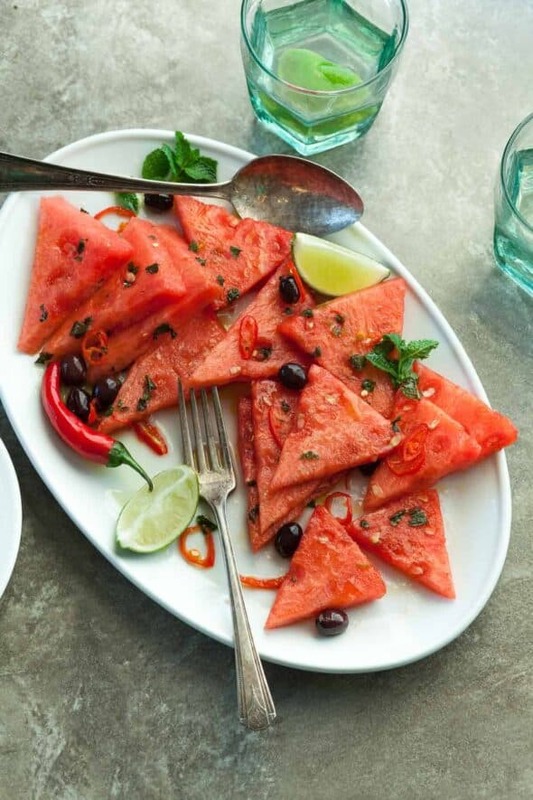 Fresh chili peppers add welcome heat to this refreshing summer salad of watermelon, mint and olives. Watermelon is the quintessential fruit of the season, an undeniable symbol of summertime. Yes there are peaches and nectarines too, and all kinds of cherries and berries but nothing refreshes you quite like a crisp wedge of watermelon does on a hot summer day. No summer celebration is complete without it; juicy, sweet and cooling, it’s always a crowd pleaser. 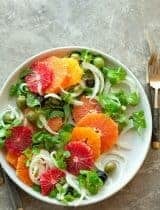 Perhaps the best way to enjoy it is simply to cut it into big chunks and bite in, juices dripping down your hand and all, but it also makes for a wonderful salad. 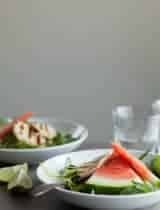 This particular watermelon salad checks all the right boxes; it’s fresh and cooling, savory and sweet, and of course crisp and juicy. 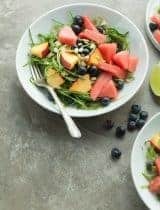 Now watermelon and salt are a classic combination so it makes sense that watermelon would be such a natural in salads. 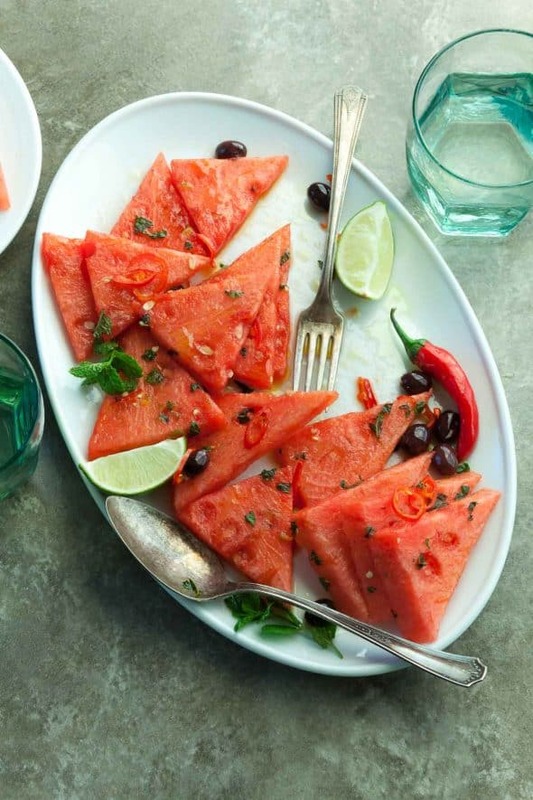 If you’ve never tried it, next time you tuck into a slice of freshly cut watermelon add a just the tiniest pinch of the best seas salt you can get your hands on and see the difference it makes. Salty olives will do the trick as well, which is why we often see them paired with watermelon in salads. 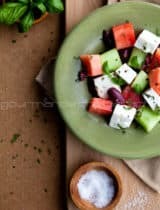 For this salad, I’ve topped chunks of watermelon with tiny, briny black olives along with a handful of fresh mint and finely sliced red chili pepper. (The chili pepper adds a bit of a kick while the mint keeps it fresh.) It’s then dressed with a simple mixture of lime zest, lime juice and olive oil. 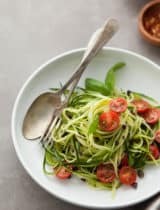 The result is an easy summer side with a kick that takes only minutes to achieve but gives you a lot of bang for your buck. 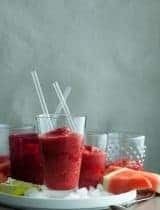 Make it now before summer and watermelon season comes to an end! In a small bowl whisk together, lime juice, lime zest, olive oil and salt. Set aside. 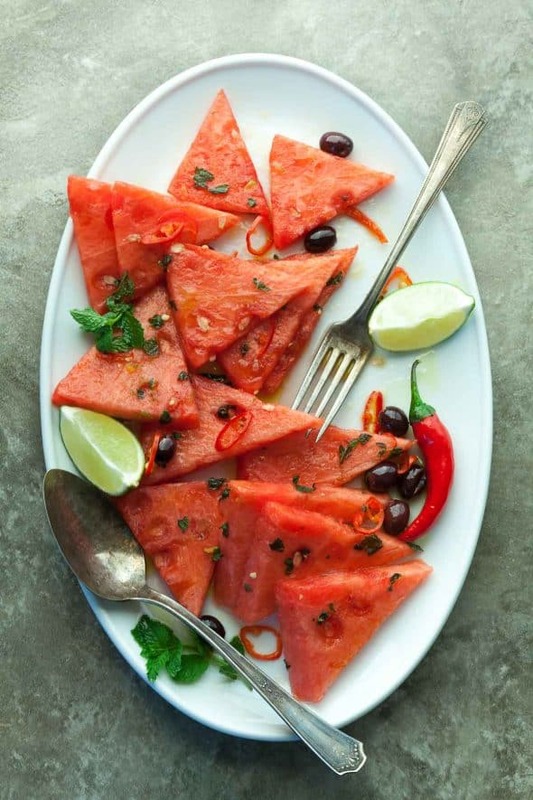 Arrange slices of watermelon on a serving platter. 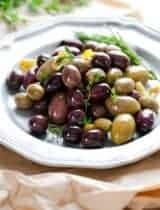 Sprinkle with mint, olives and chili pepper. 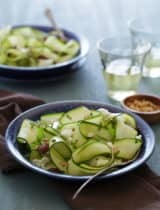 Drizzle dressing over salad and serve immediately.